Since we opted to have the Harmony blood test, we actually found out the gender of our little peanut between 11 and 12 weeks. I know! It's crazy how things are different now compared to when I was pregnant with Brooklyn. And since we took a beach vacation on fall break, we opted to find out over the phone with our toes in the sand! The nurse at the doctor's office was so sweet and she sounded just as excited as we were! We got back in town and told most of our immediate family within a few days. We couldn't wait. But I wanted to think of some fun way to share with our friends and extended family on social media. When we announced we were having a baby, two different people mentioned something about baseball vs softball and that's how I got the idea for the reveal. I'm still pretty surprised! I have two sisters and 3 nieces. The only "boys" in my immediate family are my dad and the men that married in. Everyone always jokes with my dad about living in a woman's world. 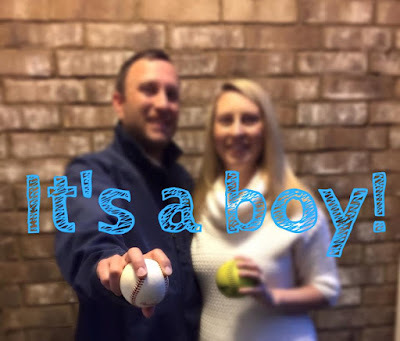 Well, now team boy is getting one more member in April. 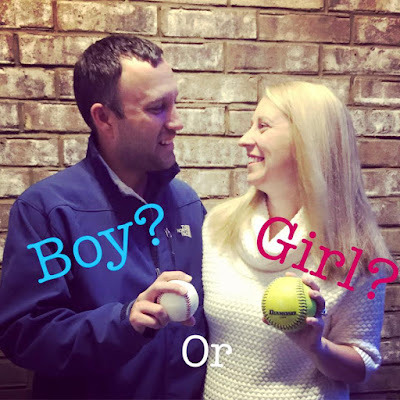 I'm one of four girls and only have one brother so I feel like if I ever find out I'm pregnant with a boy it will be a HUGE shock to me, haha! I'm so excited for you guys!